What is this German Colonial Clock worth? 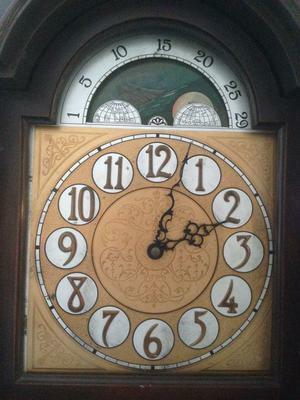 What is the name of this German Colonial Clock? 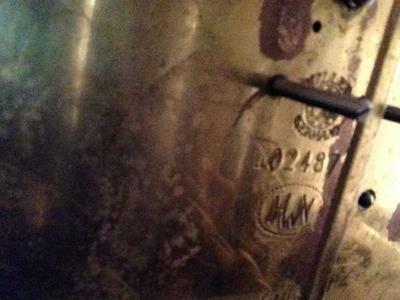 What is the value of this German Colonial Clock? 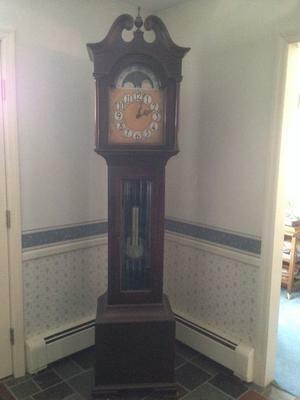 My parents are selling there house and have a Colonial Grandfather Clock (made in Germany) that has been passed down. I am trying to some information on it...age, model, value. Any help would be greatly appreciated. Pictures attached. The clock was made in Zeeland, Michigan. Colonial Clock was in business from 1875 until 1989, competing with two other Zeeland clock manufacturers: Howard Miller and Sligh. In fact, Howard Miller's brother was at one time president of Colonial Clock, then went on to build the office furniture company Herman Miller. Colonial Clock made a huge variety of cases. Yours very closely resemblers one I own, but the dial is different. You can usually find the case number stamped on the back, and this can help you date the clock.